Sixteen saints have taken to the skies from the spires of Paris' Notre Dame Cathedral. 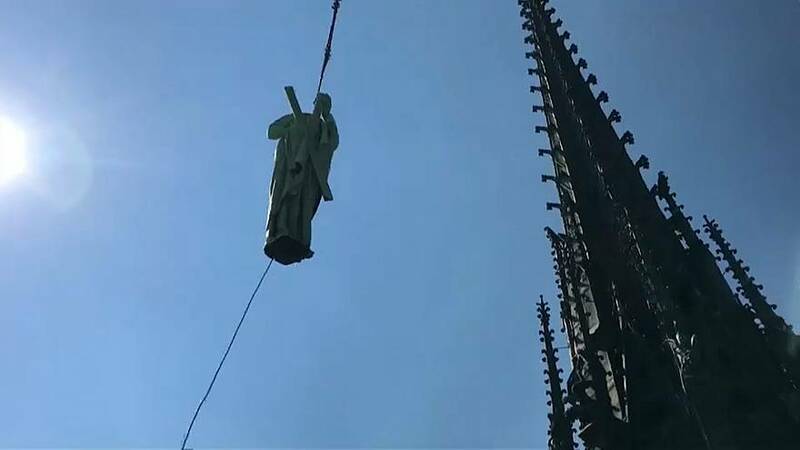 The copper statues were removed from its roof by a 100-metre crane for restoration work, as part of a €6 million project to renovate the cathedral. Some of the statues' heads were removed so that hooks could be attached to the inside of the statues, and will be brought down separately. The public had a chance to see the saints up close on the ground before they are sent to a team of restorers in southwest France. The statues will also be exhibited at Notre Dame this autumn before they are re-installed on the roof. The three-metre-high statues, weighing approximately 150 kilograms, depict the Twelve Apostles and Four Evangelists. Sculpted by Eugene-Emmanuel Viollet-le-Duc, they have crowned the 12th-century cathedral since the 96-metre spire was erected in the middle of the 19th century. This is the first time they have left their posts above the city since they were installed. Philippe Villeneuve, the chief architect for French historical monuments, said: "Since 1871, we haven't done anything to the statues. And it's been 80 years since we've done anything to the spire. So, it's a 'double' building site because we will restore something that has never been restored since Viollet-le-Duc [put it there]." Notre Dame, on the Île de la Cité in the centre of Paris, is one of the city's most famous symbols and welcomes 12 million worshippers and visitors a year.